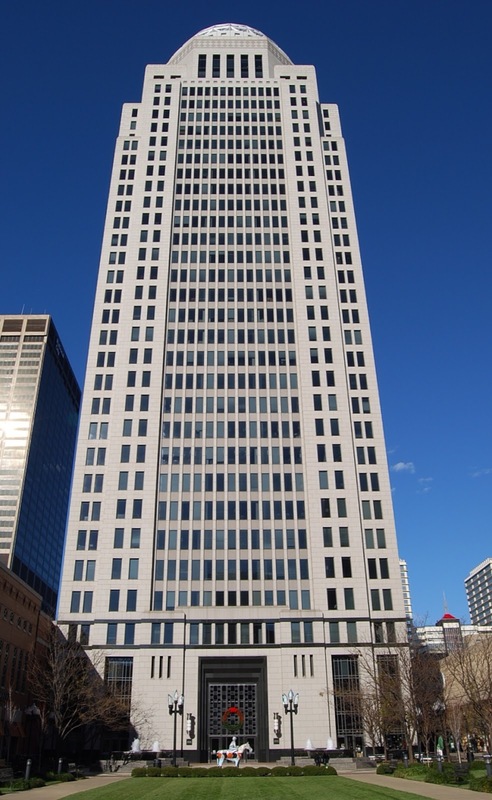 Constructed in 1993, Kentucky’s tallest building is the AEGON Center, named for one of the world’s largest life insurance and pension groups. 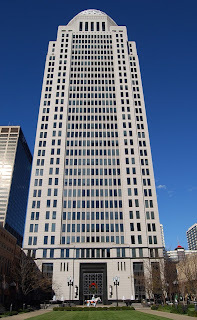 The tower is located at 400 West Market Street in Louisville. It was known first as Capitol Holdings Center and later as Providian Center. Its height is 549 feet, 35 stories. The building is constructed in postmodern architecture from reinforced concrete and granite with a white façade. It was designed by John Burgee and Phillip Johnson. The AEGON Center is located on a half-acre plaza with a granite floor decorated with many trees, lamps, and fountains. The top of the tower is embellished with a Romanesque dome standing 80 feet high, which is illuminated from at night, along with the highest floors of the building. The lights are white for most of the year, but they are changed to red and green from Thanksgiving through New Year’s Day. I ran the stairs of the AEGON Center on March 24 2014 and you can read about it here. Click here to see a full list of the tallest building in each of the 50 United States.